Recent study in personalized product recommendations has revealed that over one-third of sales during a single quarter (in the participating stores) were generated from product recommendations. Amazon also has been popular for how good their recommendations are, and according to some statistics, 35% of their total revenues are coming from purchases of products that customers found through recommendations. This clearly shows the importance of having relevant, personalized product recommendations on your online store. This is why in this article, we are going to dive into the process of creating and optimizing custom product recommendations in WooCommerce and how to make the most of it. We will also learn how to create custom product recommendations based on our customer purchase history data with the help of Users Insights. Up to 31% of eCommerce site revenues were generated from personalized product recommendations in a single quarter. Increasing sales, traffic and improving conversion rate on your online store is everyone’s top priority to grow their business. Today, we will learn a number of things about product recommendations and how they play an important role in reaching all these goals. But first, let’s take a look at how product recommendations work in WooCommerce and what we can do optimize them. By default, WooCommerce simply selects random products by category to fill in the product recommendations space. This can be relevant in some situations, as products from the same category are in general relevant. But there are so many situations when the most relevant product that we can recommend, is not coming from the same category. For example, if a customer is buying a camera, the most appropriate product to recommend won’t be another camera, but rather something from the accessories category. This kind of situations is when you can find it a lot more useful to be able to create custom product recommendations rather than using the WooCommerce default behavior of selecting random products from a category. By creating custom product recommendations you’ll be able to make recommendations that are positive, reflecting well on your products and your brand. Not only you can show specific related products that are commonly bought together, but you can also increase conversion and sell more products by making smarter product recommendations. In this way, you will also help out the customers find the right products and find them more quickly. Out of the box, there is no way to set custom related products in WooCommerce, but luckily there are numerous plugins that will add WooCommerce related products settings to your store. One of the more simple WooCommerce related products plugin that gets the job done, is the Custom Related Products for WooCommerce plugin. This plugin simply lets you choose which products to display in the related products area of the product detail page. It does this by adding Related Products selector on your WooCommerce product options page. To create custom product recommendations, in your WooCommerce product page, click on Edit Product and then under Linked Products, you will have a Related Products section alongside the Cross-Sells and Up-sells. Here you can select some products to display in the WooCommerce related products widget. If you have not selected any products to show, it will fall back to the default behavior of WooCommerce of showing random products from the same category. Now that we know how to create custom product recommendations with WooCommerce, let’s look into the process of how to decide which products to display in the WooCommerce related products section. One approach is to base your decisions on your customer purchase history. By tracking and analyzing your customers’ past purchasing behavior with Users Insights, you can design highly targeted marketing campaigns based on the specific preferences and taste of your customers. The simplest way to find the best product recommendations combinations is to pull out customers’ purchase history to find out your hottest products. 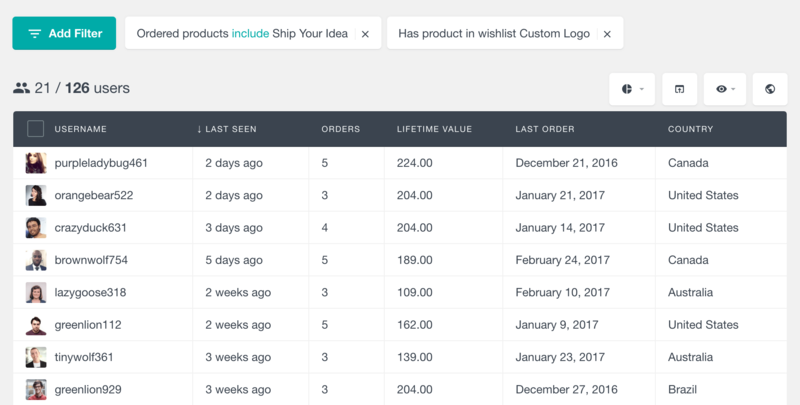 We can get this data from Users Insights using “ordered products” filter in addition to other filters. For example, if we want to know if a product is popular among our loyal customers or not, we can do it by applying filters “Ordered products include” and “Orders is bigger than 3”. We could also use a combination of “ordered products” filter to filter out the popular products among our customers. In this case, we will apply a combination of the same filter twice. This gives us the list of customers who have purchased both products. We can try different product combinations to find which two products are purchased together most often. In this way we can use a combination of these to show as WooCommerce related products on our WooCommerce website. We can also add another filter to this combination of the same filter to get more accurate results. For example, we can add another filter “Orders is bigger than 3” with two “Ordered products include” filters. This will only show customers with more than 3 orders and have ordered the selected two products. In some scenarios, you might have to create custom product recommendations if you are targeting a location. For example, if you want to know whether a product is popular in a specific country or city, you could apply filters “Country is United States” and “Ordered products include” filter. Then you could link this product to show as a recommended product with some other product that is related but perhaps not selling as well. This could bring positive results to your underselling product in a specific area because it is most likely to get more exposure after you make it as a recommendation. Another similar approach would be to filter your customers based on the products that they have in their wishlists. For example, by trying different products in the “Has product in wishlist” filter, you can find which are the most popular wishlist products by the customers who have purchased your selected product. This bears the question: How do I find the pair of products that my most loyal customers are usually buying together? This is what we are going to learn now. Apply a combination of filter that includes “Lifetime value”, “Number of Orders” and two “Ordered products” filters. 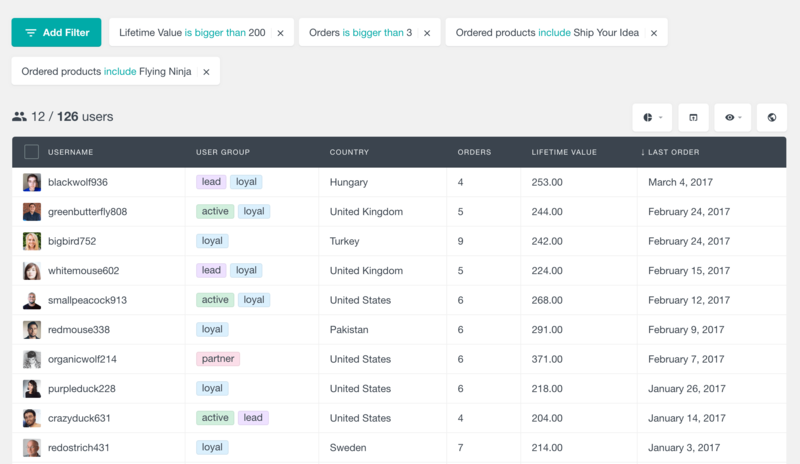 Using the combination of different filters applied with the “ordered products” filter of Users Insights, you can get valuable insights from your customer data. In this scenario, we saw that a pair of products is really popular among our loyal customers. Pulling out customer purchase history data in Users Insights lets us know more about our customers’ preferences and product performance on our WooCommerce store. Similarly, we can change the parameters of the same filters to get different results. For example, if we just change the lifetime filter parameter to “Lifetime value is less than 200”, it would give us a popular pair of products among our new and/or infrequent customers. Playing around with the combination of filters would give you useful insights depending on your needs. In this article, we learned about the difference between custom related product recommendations in the WooCommerce default behavior of selecting random products. We took a look at how creating custom product recommendations can benefit us in terms of increasing sales and traffic on your website. We learned about the importance of pulling out customer purchase history to find the best product recommendations combinations. Our main focus of this article was to show you how you can help the customers find the right product easily and how you can use a combination of filters in Users Insights to make that happen.